Wishes are delivered in the most stunning way by gifting this Deep Love Chocolate Bouquet for lovely people in a lovely way. 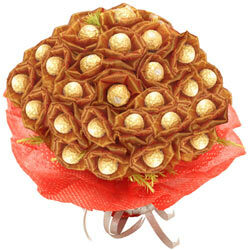 This Chocolate Bouquet is arranged with 24Pcs Ferrero Roacher Chocolates. (Note The design of this chocolate Bouquet may vary).